This article is a brief summary about MTP/MPO (multi terminated push on) pre terminated fibre. MTP or MPO depending on the vendor stands for multi terminated push on and is another form of high density Preterminated Fibre. This is simply a plug and play solution for fibre, no terminating ,no splicing simply plug in and walk away. This type of solution is becoming increasingly popular with data centres and other high density end users. Multi mode OM1 / OM2 / OM3 / OM4. Any type of connection but the most common used today is LC and SC. The purpose of MTP cassettes is to have 12 or 24 cores of fibre terminated in a enclosure and presented for operation as soon as it is installed. To the right you will see 12 cores of fibre terminated inside the cassette to the back of connectors. The different coloured leads in the cassette are commonly known as pig tails and we will cover that off further in coming articles. All of the terminations inside the cassette is done in the factory and tested before your customer receives them and installs them. The old method of termination was to terminate each coloured lead individually in the field, which on average would take any where from 10 to 15 minutes per lead including preparation, multiply by 12 leads - (12 fibres) there is about 3 hours of work there. with the cassette all ready terminated and ready for operation, install time now is about 30sec. Now with your pre-terminated fibre lead all ready installed your whole network will be ready for operation at a fraction of time that it use to take to install 12 cores of fibre. - Rapid Deployment- factory terminated modular system saves installation and reconfiguration time during moves, ads and changes. - MTP Interface- MTP US Conec brand components feature superior optical and mechanical properties. - Optimised Performance- low loss MTP Elite, discreet Premium connectors and OM4 fibre assures low insertion losses and power penalties in tight power budget high speed network environment. 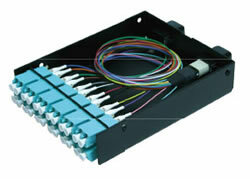 - High Density- 12 or 24 fibre cassettes can be mounted in 1U space scaling up to 72 or in 3U space scaling up to 336 discreet connectors. - Reliability- 100% Tested- combination of high quality components and manufacturing quality control guarantees product to the highest standards.